Interest in chronic pain after surgery has grown since the finding that more than a fifth of patients attending chronic pain clinics cite surgery as the cause for their chronic pain. The problem is not limited to major surgery; even common minor procedures such as hernia repair have a significant risk of chronic pain. Surgical technique can influence the development of chronic postsurgical pain (CPSP) and techniques to minimise nerve injury should be used where possible. Central nervous system changes contribute to the development of persistent pain following surgical trauma and nerve injury. Pharmacological agents that interrupt the mechanisms contributing to central sensitisation may be helpful in reducing the incidence of CPSP. Psychosocial factors are also important in the development of chronic pain and should be addressed as part of a holistic approach to perioperative care. This paper will explore the pathophysiological mechanisms that contribute to chronic postsurgical pain (CPSP), and the surgical and psychological risk factors that have been identified. Surgical and pharmacological strategies to reduce the development of CPSP will also be discussed. We will also consider how psychosocial factors influence the development and maintenance of chronic pain and the relevance of this to CPSP. The trauma and inflammation that occurs from cutting and handling tissues during surgery activates nociceptors. Nociceptive stimuli are transduced into electrical impulses that are carried to the spinal cord via primary afferent Aδ and C fibres. 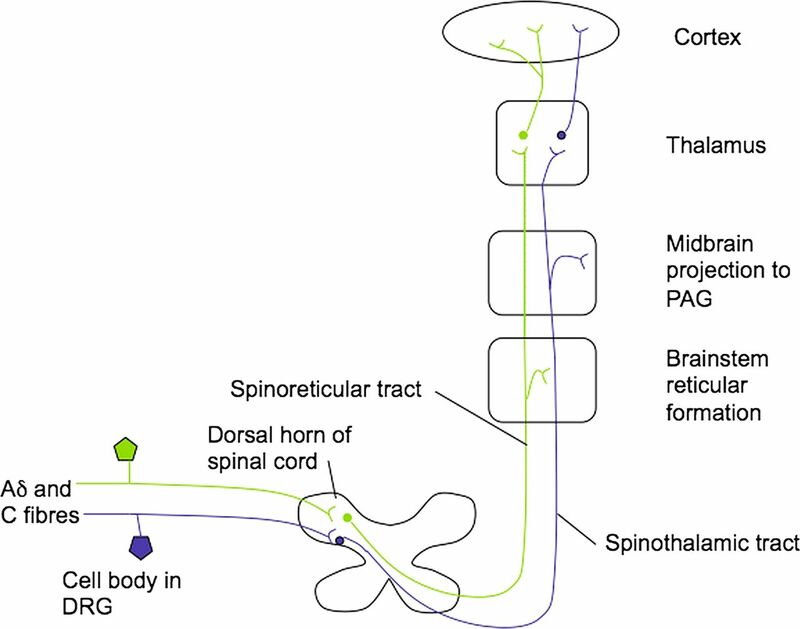 Primary afferent neurones synapse with secondary afferent neurones in the dorsal horn of the spinal cord and carry impulses to higher centres via the contralateral spinothalamic and spinoreticular pathways, the two main ascending pain pathways. There are multiple further projections to the cerebral cortex and other higher centres. Central processing of impulses leads to the experience of pain. The complex pathways of nociceptive transmission are well described5 (figure 1). Ascending pain pathways8 reproduced with permission. DRG, dorsal root ganglion; PAG, periaqueductal grey matter. Wind-up, long-term potentiation and secondary hyperalgesia are all processes associated with central sensitisation. Wind-up occurs with repeated activation of C fibres and is due to the action of glutamate at NMDA (N-methyl-D-aspartate) receptors. Under normal conditions, a magnesium ion blocks the NMDA receptor. With ongoing painful stimuli, the magnesium block is removed and the response of second-order neurones to painful stimuli is amplified. This explains why NMDA receptor antagonists, such as ketamine, are useful in attenuating or blocking wind-up.10 The response of second-order neurones may outlast the initial stimulus and this is known as long-term potentiation, contributing to hyperalgesia. A lowering of the pain threshold outside of the area of inflammation (secondary hyperalgesia) occurs because of increased activation of second-order neurones in the dorsal horn of the spinal cord. The process of central sensitisation is thought to be important for the development of persistent pain;14 hence, surgical techniques and pharmacological interventions to minimise central sensitisation are of great interest. Risk factors have been identified for the development of CPSP (table 2). Some of these, such as genetic predisposition and gender, are not modifiable; however, it may be possible to reduce the risk by giving consideration to surgical approach, pain management and psychological predisposition. Many operations do not involve transection of nerve trunks, but nerve injury may occur by stretching or crushing of nerves during tissue retraction or in cutting skin, viscera, fascia, muscles and joints, all of which are innervated by sensory nerves.17 However, it is apparent that factors other than nerve injury are an important cause of chronic pain. Intraoperative nerve transection does not always result in neuropathic pain, and avoiding nerve transection does not necessarily prevent chronic pain.4 The duration of surgery influences the development of chronic pain, with operations lasting greater than 3 h associated with an increased risk.18 This may be a reflection of complex pathology and the degree of intraoperative tissue damage. Considering the pathophysiological mechanisms proposed to contribute to chronic pain, it would seem logical that good perioperative pain control should have a long-term benefit by reducing central sensitisation. Regional anaesthetic techniques use local anaesthetics to block the conduction of impulses along nerves. By minimising the transmission of signals to or within the spinal cord, it may be possible to prevent the barrage of nociceptive inputs into the dorsal horn and hence prevent central sensitisation. Spinal and epidural techniques act on the nerve roots while peripheral nerve blocks, plexus blocks and wound infiltration interrupt impulses in peripheral nerves. A recent Cochrane review found epidural analgesia for thoracotomy to be beneficial in reducing the risk of chronic pain at 6 months, and for paravertebral blocks in reducing chronic pain following breast cancer surgery at 5–6 months.20 Spinal anaesthesia has also been shown to be beneficial relative to general anaesthesia in reducing the risk of chronic pain after caesarean section.21 Limb amputation is associated with a high risk of chronic pain. Nerve injury is unavoidable; however, perioperative epidural analgesia reduces the incidence of severe phantom limb pain.5 Although there is some evidence for the benefit of regional anaesthetic techniques in reducing persistent pain after surgery, it is not clear-cut for all procedures. Gabapentin was initially introduced as an anticonvulsant in the 1990s. Subsequent trials showed it to be beneficial in the treatment of neuropathic pain.27 It acts at the α-2-δ subunit of presynaptic calcium channels, inhibiting calcium influx and subsequent release of excitatory neurotransmitters in the pain pathways.28 Pregabalin is structurally similar to gabapentin. It has greater analgesic potency and a more favourable pharmacokinetic profile relative to gabapentin. There is evidence from randomised controlled trials supporting the use of pre-emptive gabapentin in reducing acute postoperative pain.29 ,30 A systematic review and meta-analysis on the development of CPSP after perioperative gabapentin and pregabalin has recently been published. A positive effect of gabapentin was found in four out of eight studies. Among the six gabapentin trials that could be included in the meta-analysis, gabapentin caused a moderate-to-large reduction in the development of CPSP.31 All three studies included in the systematic review of the effects of pregabalin on CPSP showed significant preventive analgesic effects. Four of the six studies that analysed long-term functional outcomes found benefits of gabapentin and pregabalin. This analysis provides evidence that the reduction in CPSP may be linked to perioperative administration of these medications. However, there were a limited number of studies in this review, and this, along with the suggestion that publication bias may be present, means that future well-designed studies are needed to clarify whether gabapentin and pregabalin have a perioperative role in the prevention of CPSP. A meta-analysis of intraoperative intravenous lignocaine found a reduction in acute postoperative pain, with those undergoing abdominal surgery demonstrating the greatest benefit.32 Systemic local anaesthetics have also been found to have antihyperalgesic effects that last for days after surgery, long after the local anaesthetic action of the drug. The mechanism of action is not fully understood and cannot be explained by blockade of sodium channels.33 However, these findings suggest that lignocaine may have a role in preventing central sensitisation and hence as a preventive analgesic. The experience of pain is more than the detection of noxious stimuli transmitted to the central nervous system. Pain perception is influenced by mood, memories, expectation and social environment and so psychosocial factors should be considered alongside pain assessment and management. 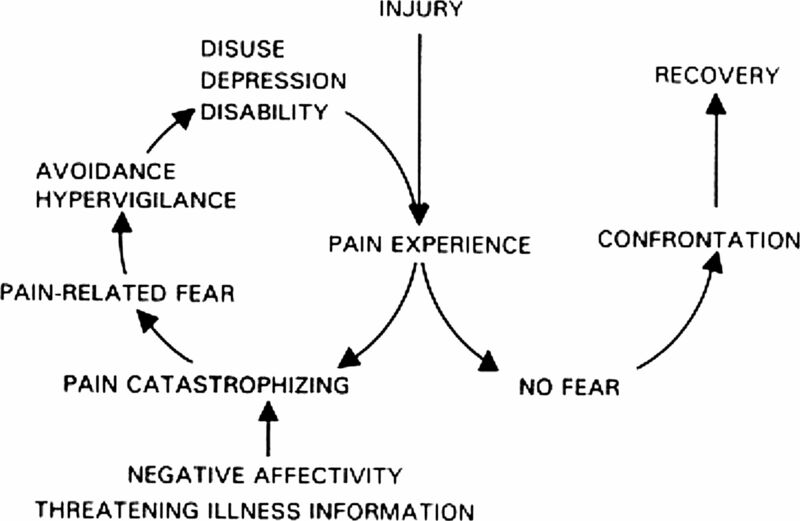 The fear-avoidance model (figure reproduced with permission of International Association for the Study of Pain39). Making sense of pain, what it may mean and what it does not mean are essential for effective coping.36 Pre-emptive cognitive and behavioural interventions decrease anxiety before and after surgery, reduce postoperative pain intensity and analgesic use.44 A study by Egbert et al nearly 50 years ago demonstrated a reduction in morphine requirements and length of stay when patients were provided with preoperative information about likely postoperative treatments and discomfort and instruction on relaxation techniques.45 When patients are given information about what they should expect to feel, in addition to procedural information, they experience less pain and distress compared with either type of information given alone.46 Relating this back to the fear-avoidance model we can see that information can provide reassurance that the sensations experienced after a procedure are normal and non-threatening. For example, following a total knee replacement, patients are encouraged to mobilise within hours of surgery. This may be uncomfortable, but it is important that patients are reassured that pain does not equal damage, that it is normal to experience some discomfort and it does not mean that they are jeopardising their operation or that something is wrong. Managing expectation is recognised as an important component of enhanced recovery programmes. Carefully presented information from surgeons, anaesthetists and nurses about the surgical procedure, anticipated sensory experiences, analgesic treatment and recovery period is expected to reduce anxiety and promote recovery.48 By addressing these issues in the perioperative period, it may be that we can also reduce the progression to persistent pain and disability in those at risk. By understanding the physiological processes that contribute to persistent pain, we can use therapeutic interventions to minimise the progression from acute to chronic pain. An awareness of the risk factors for CPSP may help to identify those at high risk and target interventions accordingly. The impact of psychological factors on the pain experience should always be considered, and a collaborative approach involving patients in their treatment decisions is recommended for patients to experience the best outcome. Moderate-to-severe postoperative pain is a risk factor for chronic postsurgical pain. Perioperative epidural analgesia has no impact on chronic postsurgical pain. Perioperative ketamine has no effect on postoperative opioid requirements or side effects. Gabapentin may be useful in preventing chronic postsurgical pain. Surgical technique can influence chronic postsurgical pain. Chronic postsurgical pain makes a significant contribution to the burden of chronic pain. Perioperative pain contributes to central sensitisation and subsequent chronic postsurgical pain. Surgical technique and intraoperative nerve injury are risk factors in chronic postsurgical pain. Regional anaesthetic techniques reduce the risk of chronic postsurgical pain following breast cancer surgery and thoracotomy. Adjuvant analgesic drugs including ketamine, gabapentin and pregabalin may be useful as preventive analgesics, reducing chronic postsurgical pain. What are the genetic factors that predispose individuals to chronic postsurgical pain? Why do some patients with intraoperative nerve damage develop chronic postsurgical pain whereas others do not? Is it possible to identify patients with psychological risk factors for chronic postsurgical pain preoperatively and modify their risk? Macrae WA. Chronic post-surgical pain: 10 years on. Br J Anaesth 2008;101 : 77–86. Macinytre PE, Schug SA, Scott DA, et al. ; APM:SE Working Group of the Australian and New Zealand College of Anaesthetists and Faculty of Pain Medicine. Acute Pain Management: Scientific Evidence. 3rd ed. Melbourne: ANZCA & FPM, 2010. Eccleston C. Role of psychology in pain management. Br J Anaesth 2001;87(1):144–52. Vlaeyen JW, Linton SJ. Fear-avoidance and its consequences in chronic musculoskeletal pain: a state of the art. Pain 2000;85 : 317–32. Kehlet H, Jensen TS, Woolf CJ. Persistent postsurgical pain: risk factors and prevention. Lancet 2006;367 : 1618–25.
. Cut and thrust: antecedent surgery and trauma among patients attending a chronic pain clinic. Pain 1998;76:167–71.
. Inguinal hernias. BMJ 2008;336:269–72.
. Clinical effectiveness and cost-effectiveness of treatments for patients with chronic pain. Clin J Pain 2002;18:355–65.
. Chronic post-surgical pain: 10 years on. Br J Anaesth 2008;101:77–86.
.; APM:SE Working Group of the Australian and New Zealand College of Anaesthetists and Faculty of Pain Medicine. Acute Pain Management: Scientific Evidence. 3rd ed. Melbourne: ANZCA & FPM, 2010.
. Nociceptors-noxious stimulus detectors. Neuron 2007;55:353–64.
. Persistent postsurgical pain: risk factors and prevention. Lancet 2006;367:1618–25.
. An introduction to pain pathways and mechanisms. Br J Hosp Med 2013;74:C188–91.
. Spinal cord mechanisms of pain. Br J Anaesth 2008;101:8–16.
. A qualitative systematic review of the role of N-Methyl-D-aspartate receptor antagonists in preventive analgesia. Anesth Analg 2004;98:1385–400.
. Neuropathic pain: diagnosis, pathophysiological mechanisms, and treatment. Lancet Neurol 2010;9:807–19.
. Neuropathic pain : aetiology, symptoms, mechanisms, and management. Lancet 1999;353:1959–64.
. Neuronal Plasticity: Increasing the Gain in Pain. Science 2000;288:1765–8.
. Models and Mechanisms of Hyperalgesia and Allodynia. Physiol Rev Suppl 2009;89:707–58.
. A questionnaire study investigating the prevalence of the neuropathic component of chronic pain after thoracic surgery. Eur J Cardiothoracic Surg 2006;29:800–5.
. Chronic post-treatment symptoms in patients with breast cancer operated in different surgical units. Eur J Surg Oncol 1999;25:38–43.
. Transition from acute to chronic postsurgical pain: risk factors and protective factors. Expert Rev Neurother 2009;9:723–44.
. Somatic and psychologic predictors of long-term unfavorable outcome after surgical intervention. Ann Surg 2007;245:487–94.
. Persistent pain and sensory changes following cosmetic breast augmentation. Eur J Pain 2011;15:328–32.
. Local anaesthetics and regional anaesthesia for preventing chronic pain after surgery. Cochrane Database of Systematic Reviews 2012;(10).
. Chronic pain following Caesarean section. Acta anaesthesiol Scand 2004;48:111–16.
. Preemptive Analgesia. Anesthesiology 2000;93:1138–43.
. Ketamine: new uses for an old drug? Br J Anaesth 2011;107:123–6.
. Management of perioperative pain in patients chronically consuming opioids. Reg Anesth Pain Med 2004;29:576–91.
. “Balanced analgesia” in the perioperative period: is there a place for ketamine? Pain 2001;92:373–80.
. Intraoperative epidural analgesia combined with ketamine provides effective preventive analgesia in patients undergoing major digestive surgery. Anesthesiology 2005;103:813–20.
. Morphine, Gabapentin, or Their Combination for Neuropathic Pain. N Engl J Med 2005;352:1324–34.
. Gabapentin: a new drug for postoperative pain? Br J Anaesth 2006;96:152–5.
. A Randomized Study of the Effects of Single-dose Gabapentin versus Placebo on Postoperative Pain and Morphine Consumption after Mastectomy. Anesthesiology 2002;97:560–4.
. Evaluation of the Optimal Preemptive Dose of Gabapentin for Postoperative Pain Relief After Lumbar Discectomy. J Neurosurg Anesthesiol 2005;17:65–8.
. The prevention of chronic postsurgical pain using gabapentin and pregabalin: a combined systematic review and meta-analysis. Anesth Analg 2012;115:428–4.
. Perioperative intravenous lidocaine infusion for postoperative pain control: a meta-analysis of randomized controlled trials. Can J Anaesth 2011;58:22–37.
. Novel ideas of local anaesthetic actions on various ion channels to ameliorate postoperative pain. Br J Anaesth 2008;101:45–7.
. The fear-avoidance model of musculoskeletal pain: current state of scientific evidence. J Behav Med 2007;30:77–94.
. Pain-related fear is more disabling than pain itself: evidence on the role of pain-related fear in chronic back pain disability. Pain 1999;80:329–39.
. Role of psychology in pain management. Br J Anaesth 2001;87:144–52.
. Psychology of pain. Br J Anaesth 2008;101:25–31.
. Imaging pain. Br J Anaesth 2008;101:32–9.
. Fear-avoidance and its consequences in chronic musculoskeletal pain: a state of the art. Pain 2000;85:317–32.
. Multidisciplinary rehabilitation for chronic low back pain: systematic review. BMJ 2001;322:1511–16.
. Risk factors for acute pain and its persistence following breast cancer surgery. Pain 2005;119:16–25.
. Psychosocial predictors and correlates for chronic post-surgical pain (CPSP)—A systematic review. Eur J Pain 2009;13:719–30.
. Anxiety and surgical recovery. Reinterpreting the literature. J Psychosom Res 2001;51:589–96.
. Acute pain. Lancet 1999;353:2051–8.
. Reduction of postoperative pain by encouragement and instruction of patients—a study of doctor-patient rapport. N Engl J Med 1964;270:825–7.
. Effects of sensory and procedural information on coping with stressful medical procedures and pain: a meta-analysis. J Consult Clin Psychol 1989;57:372–9.
. Patients’ preferences regarding shared decision-making in the treatment of inflammatory bowel disease: results from a patient-empowerment study. Digestion 2010;81:113–19.
. Anaesthesia, surgery, and challenges in postoperative recovery. Lancet 2003;362:1921–8.